Thanksgiving is one of the United States’ most significant national holidays. It’s probably second in popularity only to Christmas. Like most Americans, I grew up with it. There’s really not much to it other than cooking a lot of food and having a feast in the middle of the day, during which we are supposed to express our appreciation for all our good fortune as Americans. It has a slightly religious tone to it, but that is overshadowed by its more nationalistic implications. The myth tells that in 1621 after the pilgrims came to America they failed to properly work the land and were in danger of suffering famine. The local Wampanoag Indians took pity upon the new arrivals and taught them how to work the land and most importantly how to grow corn. I seem to recall as a child I learned that the Indians taught the Pilgrims to plant their seeds with a fish and this insured a strong and healthy crop, but I haven’t encountered this part of the myth as an adult. After the Pilgrims had a successful harvest they invited the Wampanoag to a great feast to celebrate. The two peoples partied and had a Kumbaya moment. 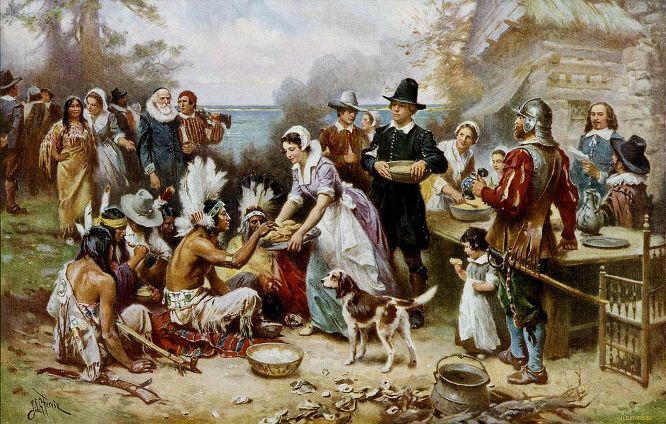 The Pilgrims made this an annual tradition and this became Thanksgiving. There isn’t much truth to this story, but it seems harmless enough. Of course Thanksgiving has taken some flack in recent decades for its usage of Native Americans as props in a story that seems to essentially justify the usurpation of American Indian title to the North American continent by colonial society. Now there is even a video circulating on TeenVogue that uses teenage girls to try to convince us that Thanksgiving actually has its origins in feasts that white people celebrated after fighting and extinguishing a Native community. It really comes off as the type of faux-outrage you’d expect from half-educated adolescents with angst. I’ve been there. I think the real shame is that it’s lazy, shallow research. Myths and legends are one thing but this is almost a crime against history. Thanksgiving is in reality a part of a long tradition of Anglo-Saxon harvest festivals that were celebrated every fall going back into historical obscurity. These were like any of the similar harvest celebrations held by agricultural communities throughout the history of the world including North America. It is essentially a part of the European wheel of the year, a vestige from the white continent’s indigenous and tribal past, but that’s true of most holidays. Some people think Indians shouldn’t celebrate Thanksgiving for political reasons. I could never get onboard with that idea. Overall I don’t have any real problem with the holiday or its symbolism. I can get annoyed by the stereo-typical white-man’s Indian play-acting, redface, and other embarrassing behaviors it encourages in non-Indians from time to time. I am left feeling bereft at the sense of equality and brotherhood it depicts between whites and Indians that rarely if ever really existed, especially when today Native communities are still being deprived of rights, and resources by the colonial governments, and the dominant society seems so unmoved and so unconcerned by it. Considering how little attention Indians get in American history and modern social and political discourse I guess we should be glad we get to be the second most significant part of the country’s second most significant holiday. At the end of the day I am an advocate for all people returning to their roots and their native traditions adjusted to their modern geographic and political circumstances. In large part that requires a meaningful celebration of the seasonal cycle for all people. Thanksgiving is a day, or an entire weekend for some folks to take time and celebrate the earth’s bounty and to strengthen our bonds with family, clan, tribe, and nation. I see a national harvest celebration as part of this ancient tradition kept alive in modern America with a uniquely American symbolism. Some people will choose not to celebrate Thanksgiving for reasons they attribute to their values, and that’s cool with me. For me Thanksgiving is a real time of gratitude, reflection, and preparation for the road ahead. I’ll get back to work after the festival.